When Midwesterners think of Scottrade Center we think of Blues Hockey, College basketball or even sensational concerts, but have you ever witnessed Scottrade full of dirt? 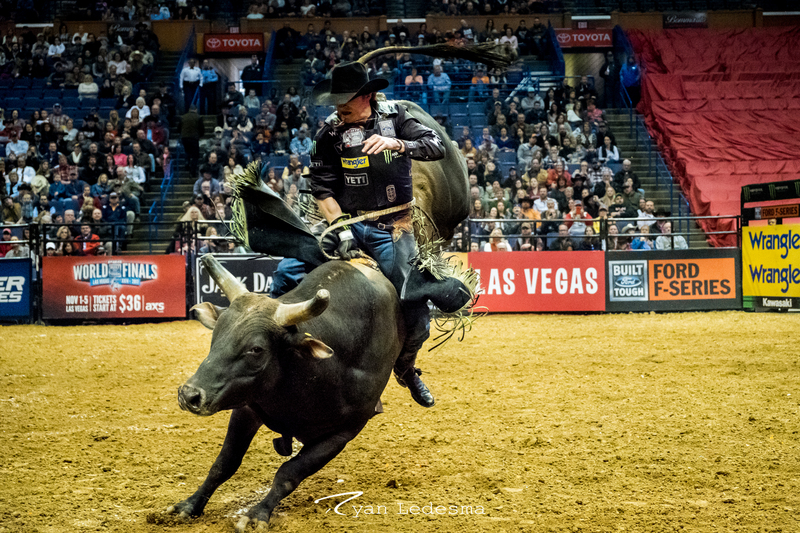 Once a year the Professional Bull Riders come thru St. Louis and do just that, fill it full of dirt. Oh yea, they also fill it full of guts, grit, behemoth bovines and the top Bull Riders in the world. 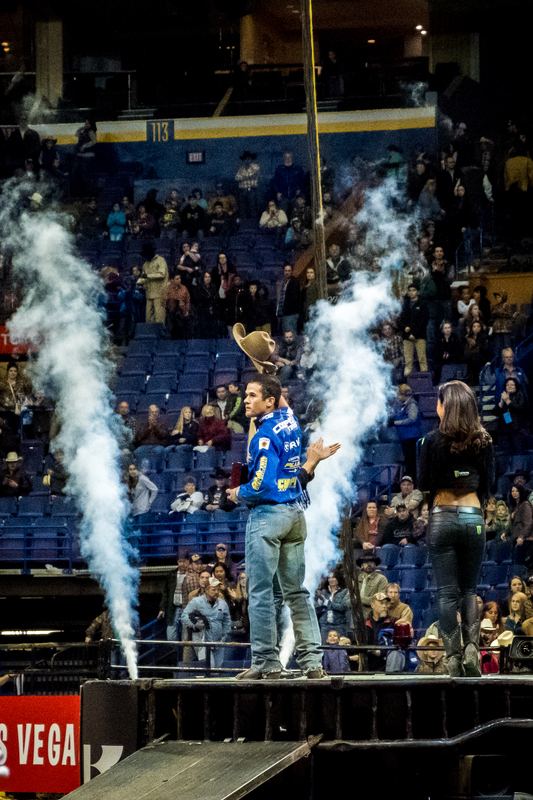 Friday, February 24th was the opening night and first round of the Bass Pro Chute Out, and the evening started with a bang, literally. Fireworks, flames, strobe lights and lasers, that’s how these cowboys are introduced; after all, they are the best in the world. After the opening ceremonies, a prayer and the National Anthem, it was time to ride. Round one, or “The Long Go”, started off with Guilherme Marchi perched atop “Red Rocket”. Guilherme set the tone for the evening by lasting a full 8 seconds on the first ride of the night and earned a score of 85.75. That score would be enough for a fourth place finish for the Long Go as well as set him up nicely for round two. Round one would shape up to be an entertaining evening that would see 11 riders last for a full 8 seconds, including a fan favorite Mason Lowe. 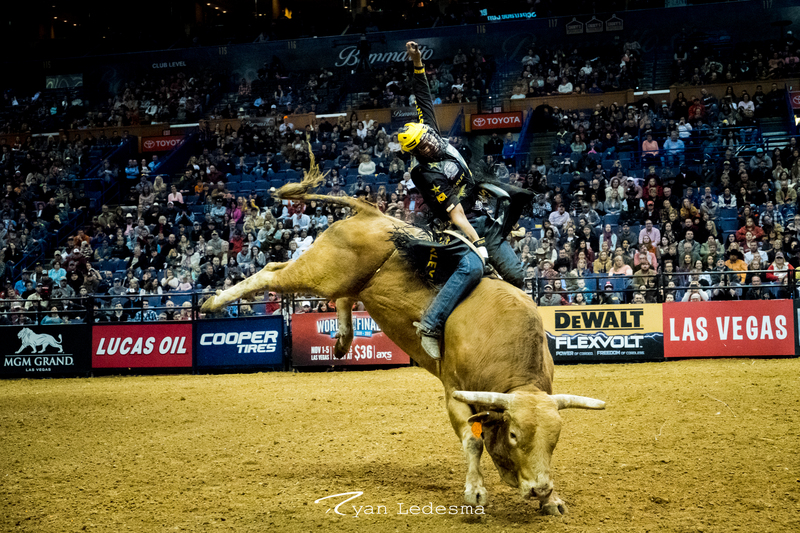 Mason is a Missouri boy, hailing from Exeter and at the age of 23 is ranked 8th in the world (as of start of competition Feb. 26) and has already earned more than $70, 000 so far this year. Mason drew “Canadian Fastlane” for round one and rode the bull to a score of 87.25. This was enough for Mason to share the top honors of round one with fellow rider Chase Outlaw. Chase also earned a score of 87.25 while atop “Gypsy Joe”. Saturday evening, February 25, round two of the Ford Motor Company sponsored event got under way right on schedule and picked up right where it left off. The Board was loaded with anxious cowboys ready to go 8 seconds and the bulls had no intentions of making that very easy. Joao Ricardo Vieira drew the first ride for the evening on Machinery Auctioneer’s “Little Joe”, the result, a victory for “Little Joe”. In stark contrast to the night before our first Bull Rider could only muster a ride of 4.58 seconds, for no score. Only 9 Bull Riders would see a full 8 seconds on this night of competition, two less than round one. Mason Lowe made an appearance again in round two and set the crowd on fire with an 8 second jaunt while riding “Booger Red”. Mason scored an even 86.00 for the ride, not enough to keep him atop the leader board but still solid enough to earn him a check and a prime spot in the overall top 5. Saturday evening and the top honors for the round went to Chase Outlaw, only this time he wasn’t sharing. 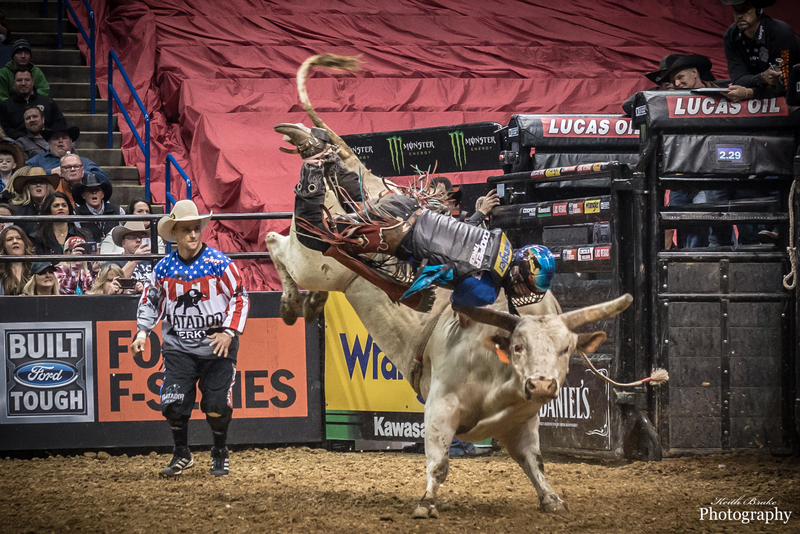 Chase earned a solid 88.00 for his ride while taming “American Sniper” for a full 8 seconds and placed himself atop the leader board in sole possession of first place. 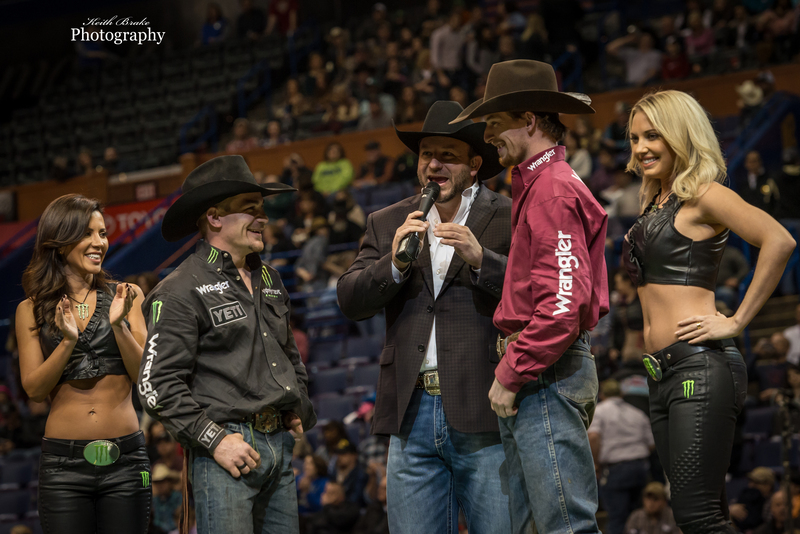 With the arrival of day three and the final round inevitable, the question on everyone’s mind is can Chase Outlaw hold off the rest of the riders at his heels. Chase started the day atop the leader board, ranked 7th in the world and in high hopes to solidify his first, first place finish this season. Close behind him is crowd favorite Mason Outlaw. The Missouri native starts the third and final day just 2 points off the leaders pace and certainly capable of jilting Chase’s hopes for a first place finish. Round 3 delivered on drama and suspense as both Chase and Mason brought in successful rides, keeping them perfect for the competition. 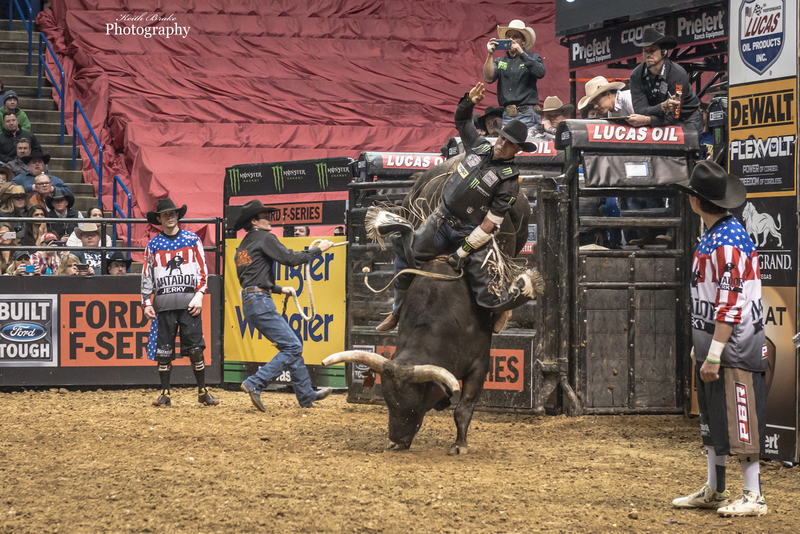 Mason drew the bull “Hustle Man” and delivered a solid ride for 84.75 points. Chase was tasked with “Mr. Big Stuff”, a KBAR C bull. Chase rode the full 8 to a score of 85.25. While these performances kept both Cooper Tires Cowboys at the top of the overall leader board, some fresh names were leading the round. 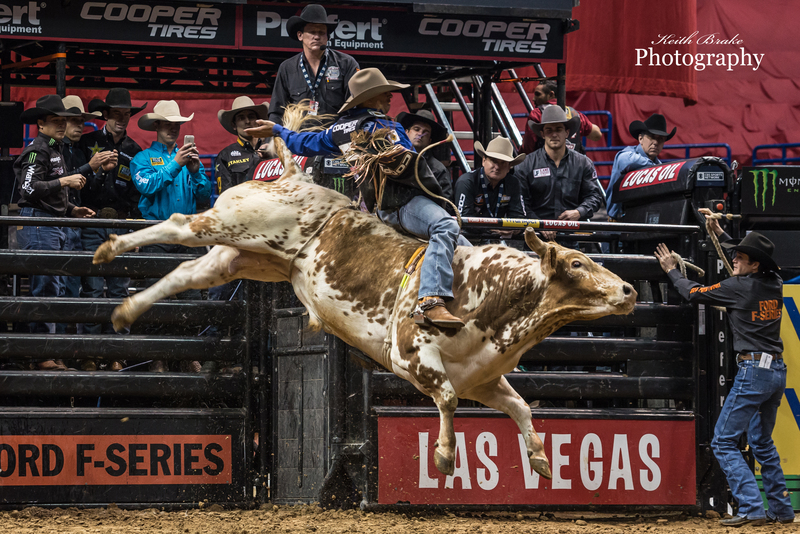 Silvana Alves, Ryan Dirteater and Matt Triplett all turned in rides for scores higher than Chase and Mason for the first during the competition, and as they headed into the final round it was Matt Triplett leading the way in round 3 with 87.25 that he scored while riding “Coopers Comet”. The Final round in a PBR event is a real treat, and has a small twist. This round the Cowboys choose which bull they will ride instead of a blind draw. Now, before you start to think that is less competitive somehow, think again. The top 15 riders have to choose from the meanest, nastiest strongest bulls that the ranchers can muster, with names like “Sevendust”, “Boot Jack” and “Lester Gillis”. The Bull they call “Lester Gillis”, by the way, had never been ridden a full 8 seconds. the weekend, Mason Lowe and Chase Outlaw. Tires “Brown Sugar”. That big St. Louis crowd got behind Mason as he made preparation to ride. The chute flew open and Mason lasted only 3.12 seconds to end his weekend on a very disappointing note. Chase Outlaw was the last man between “The Ice Man” and his overall win of the Built Ford Tough Bass Pro Chute Out. Chase had chosen “Bad Beagle” for his final bull of the day. Out of the chute, Chase looked strong and appeared as if he was going to make the ride but at 5.04 seconds “Bad Beagle” put that notion to rest ending any hopes Chase had for the overall win and solidifying Pacheco’s overall victory. Full statistics and a list of upcoming events can be found at http://www.pbr.com. Awesome and interesting review. It had me hooked and I was rooting for the Missouri kid the while article. One of the Bulls is basically standing on its head. WOW. I forgot how exciting Bull Riding is. Thanks Mike!! Glad you enjoyed the read! Top notch review and amazing pictures. Well done. Thanks Joe, glad you enjoyed it!